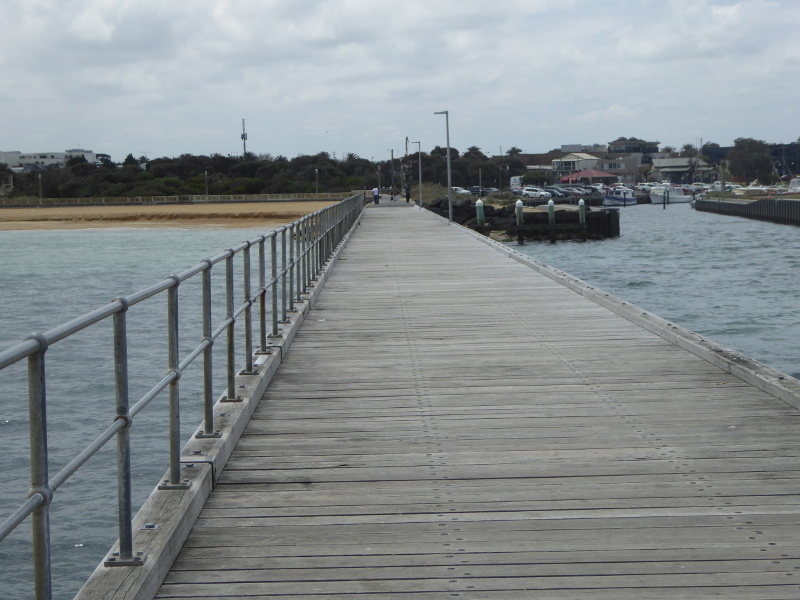 A walk along Mordialloc Pier is a good stretch of the legs. 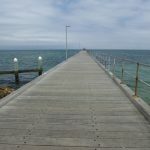 I kept stopping to look at things so may have lost count, but my step count was up at around 300 by the time I reached the fisherman pulling in another catch right down the far end of the pier. It was a calm day in November for my visit, but I can imagine in a storm it would be pretty dramatic down at the end of the pier. You could shelter a little bit on the covered benches about 20 metres from the end, but I reckon the waves come right over the pier sometimes, judging by the bits of seaweed tucked away in corners of the boardwalk all the way along. And it has had to be rebuilt a couple of times – most recently in 1986 and then 2009, I believe – so in a way we are lucky still to have this piece of vintage Victoria. It’s a popular place for all sorts of people, too, if my half hour there was anything to go by. 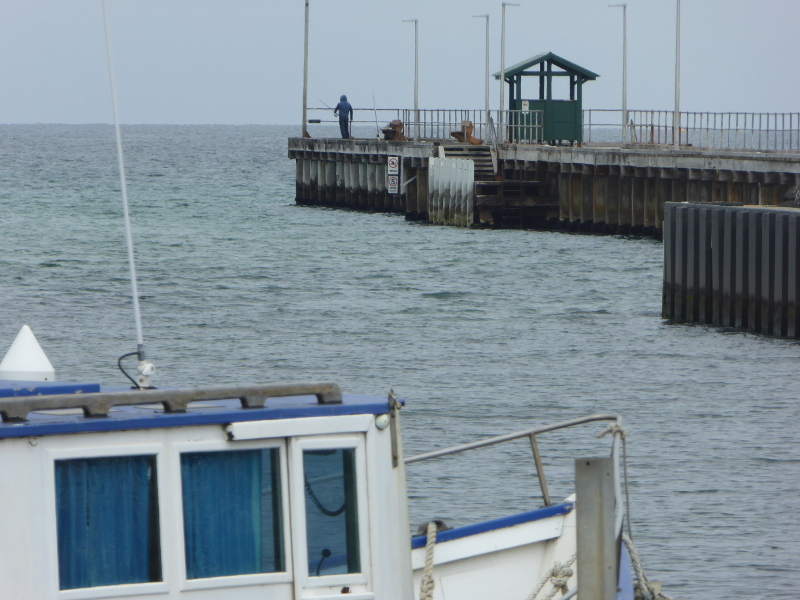 People have been fishing here since the first jetty was built at the end of Mordialloc Creek in the 1850s. And judging by the information signs about drawing your reel in for passing boats, and the fish size gauges all along the pier, it still is. There were a handful of guys down at the very end of the pier when I came along, too. And I’m guessing those rather stylish benches near the fishing end of the pier might have been put there for, maybe even by, the fishermen? There were solitary walkers like me, sprightly pensioner couples doing their daily constitutional, a Chinese family with kids in tow, and even a whole class of primary school kids turned up as I left. 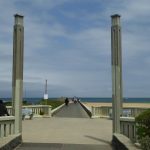 As a child I always loved the thrill of reaching the boardwalk when you could see the water through the gaps. 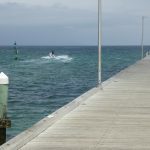 If you were a parent or teacher, you’d want pretty strict rules on the kids not wandering off too far, though, as there is no barrier all along the left side as you head out into the bay; just a very low footing to stop you from slipping in. 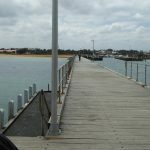 I was struck by one of the stories I later picked up on Trove, about the couple who drove along Mordialloc Pier and off the end, because back in the 1930s there was only such a low barrier even at the very end of the pier. 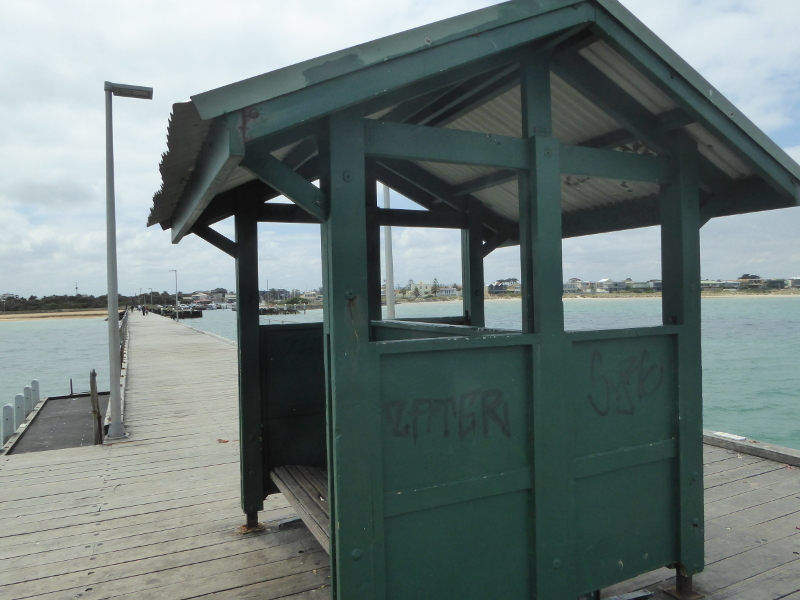 I am kind of glad the health and safety police haven’t cracked down on Mordialloc Pier yet. Mind you, the Council could do with a daily rubbish collection, though. The sheltered seats were strewn with burger cases and coffee cups and the like. It’s a tricky one to manage, though, isn’t it? Put a bin there, and that would quickly become full to overflowing; but have no bin there at all and some folk will always do the anti-social thing and leave their stuff behind. It’s a busy little stretch of water, too. 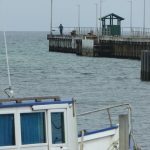 There were several boats heading out into the bay from Mordialloc, and even a sea plane flew just overhead as I turned to head back to land. 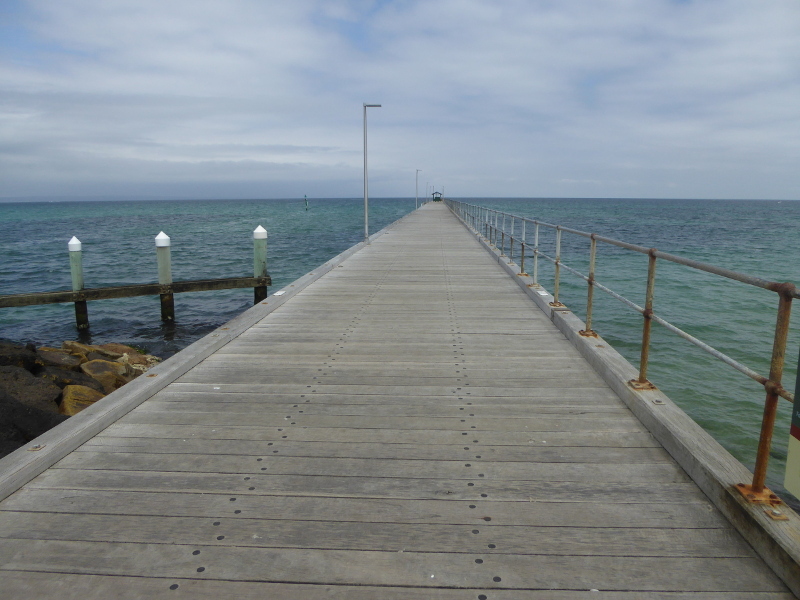 The waters were a beautiful turquoise on the day of my Mordialloc walk. Tempting to dive in, but there have been shark sightings near here on many occasions, so probably not something I’ll be rushing to do. I bet people do on hot summer’s days though. Oh, and don’t miss the lights down at the beginning of the path either. They have a 1920s look to them, I thought, but no information on any of the signs nearby, so if anybody knows, do tell us in the comments below. Ticketed parking for minimum one hour at $3.60. 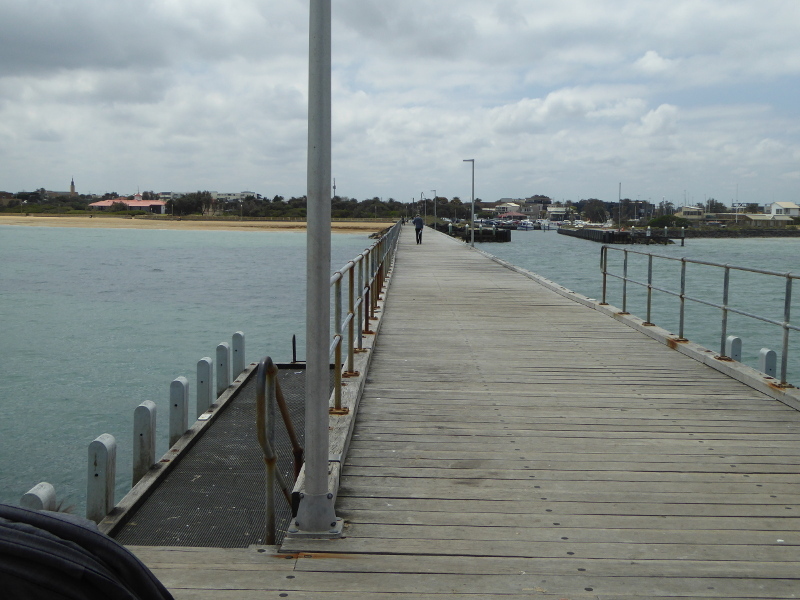 Cycle paths run right along the bay past Mordialloc Pier. 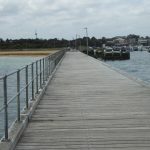 In 1857, the first jetty was built at Mordialloc. 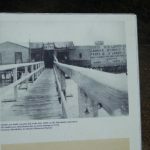 By the 1870s, there were already calls to lengthen the pier. 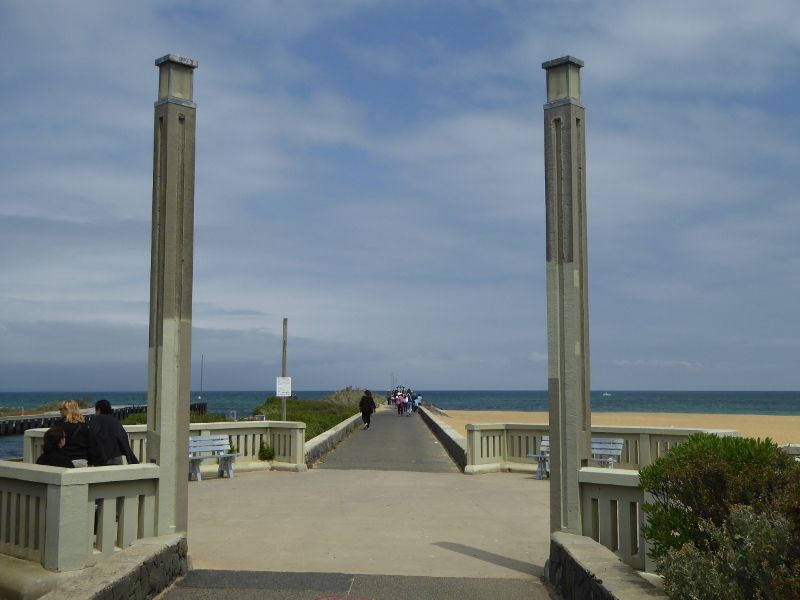 Lots of shark sightings were reported in brief, plus in 1891 a ‘large whale’ was seen close to the pier. It’s always been a popular spot to fish from – and still is today – but the fishermen sometimes got a nasty surprise, as one press clipping from February 1924 noted. 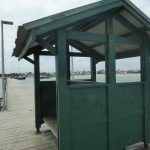 This time the poor fishermen spotted the body of a man floating near the pier; it turned out to be the owner of a Melbourne sweet shop. 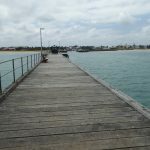 In 1907, “a pipe, hat, gold watch and a railway pass have been found on the pier at Mordialloc belonging to H. Thompson…a search is being made for his body.” No further reports in the papers, so I have no idea if Mr Thompson was ever found. 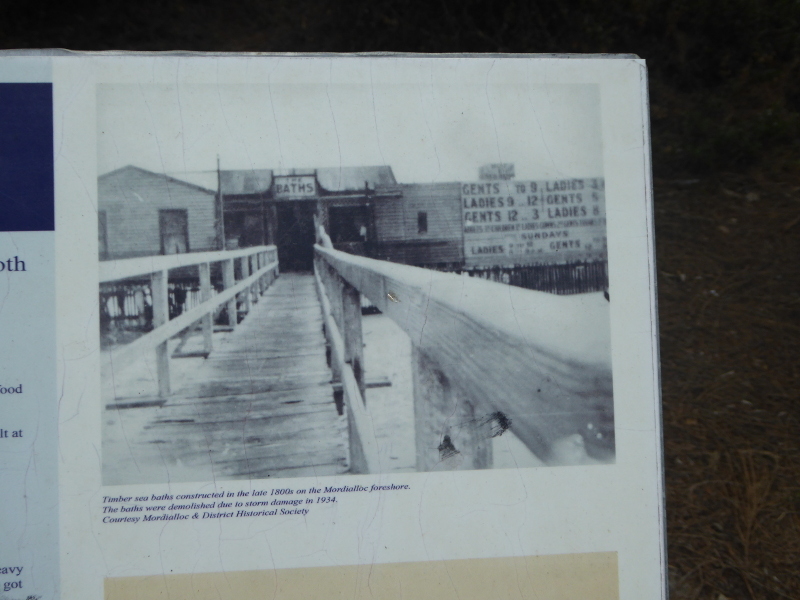 In 1932 a Buick was driven off the end of the pier in the small hours of a February morning. A couple drowned in the incident. But at the inquest, it was alleged that a road sign might have been misleading and that they may have driven along the pier not knowing it was a pier! It’s hard to imagine really, but it was 3am or so, and the guard at the end of the pier was only a couple of inches high apparently in those days. But swimming was also popular round here, in spite of those occasional shark sightings. 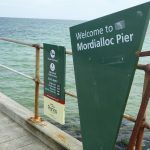 In 1927 and 1928, long distance swimming races were held from Mentone Pier to Mordialloc Pier – 2 miles with handicaps for good swimmers, and these attracted teams from as far afield as Manly in Sydney’s north shore. 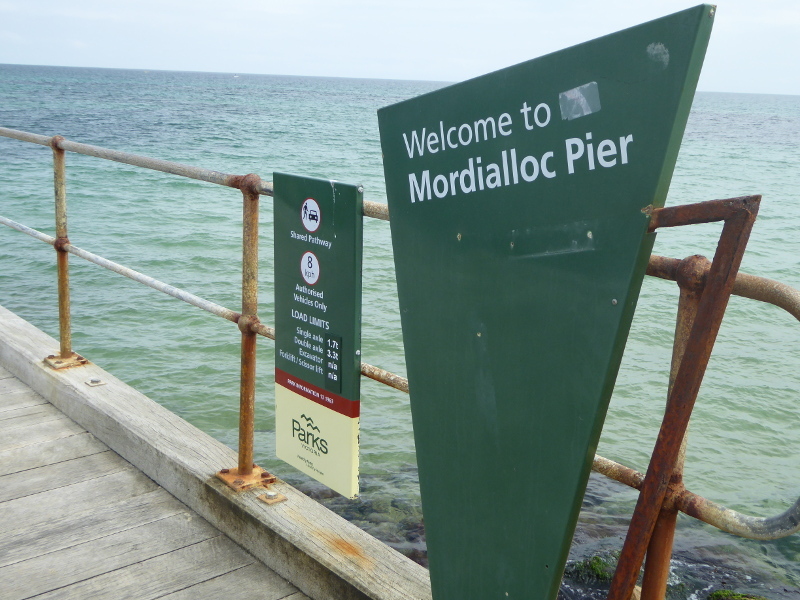 The tragedy of the couple who drove off the pier and drowned has to be the major incident off Mordialloc Pier. I noticed other press clippings from more recent times of cars tipping perilously close to dropping into the water, so the problem hasn’t gone away totally. But I wondered if the Bayside News website used the same Trove sources as me when it published a rather good summary of the 1932 Buick incident, with more information also on the people involved in the accident. 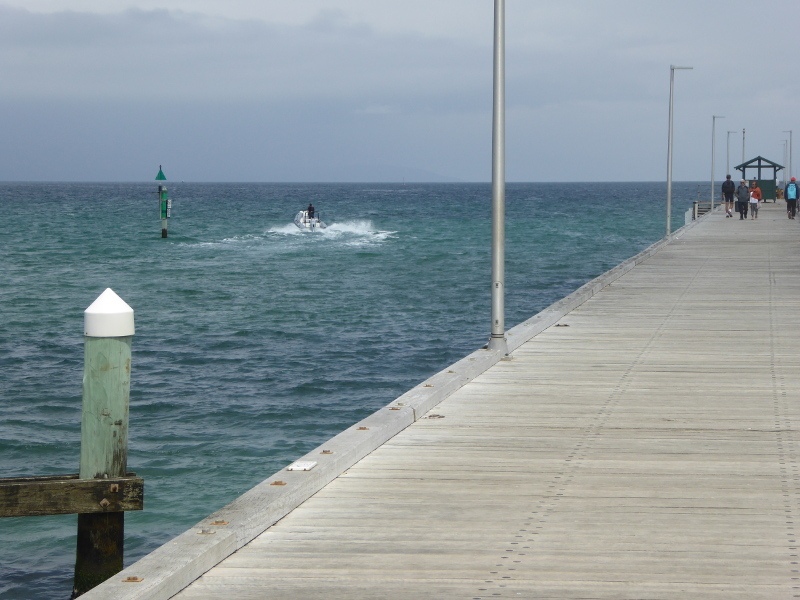 Danny Carey wrote about Mordialloc Pier in the My Place section of The Age newspaper in Melbourne. 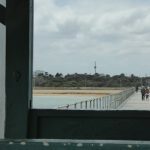 The weekend notes website recommends sunset as the best time to go for a stroll on Mordialloc Pier. This link takes you to some nice shots under the pier from photographer Jim Worrall. 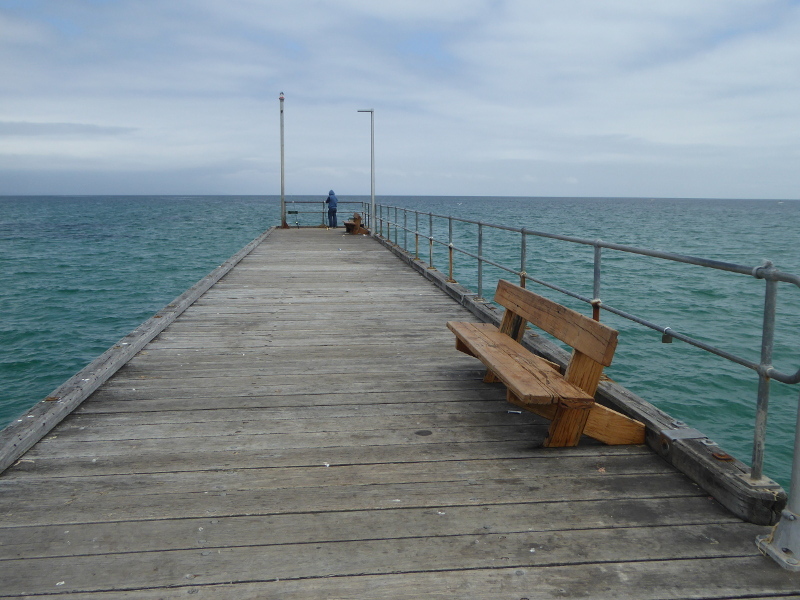 The official Parks Victoria post on Mordialloc Pier is brief but has a nice pic. 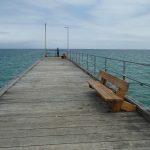 What are your stories and memories of the Mordialloc Pier? 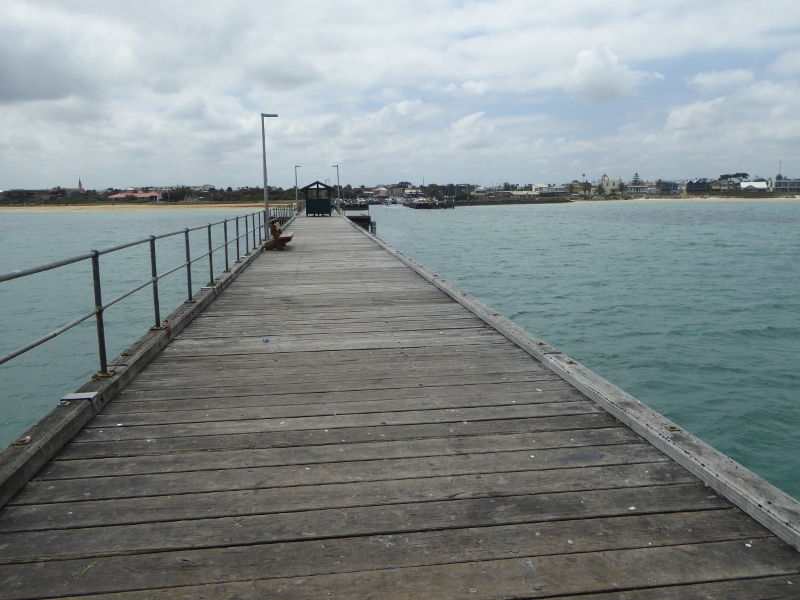 Have you seen many changes to Mordialloc Pier over the years? Can you even remember far enough back to when the sea baths were still here? 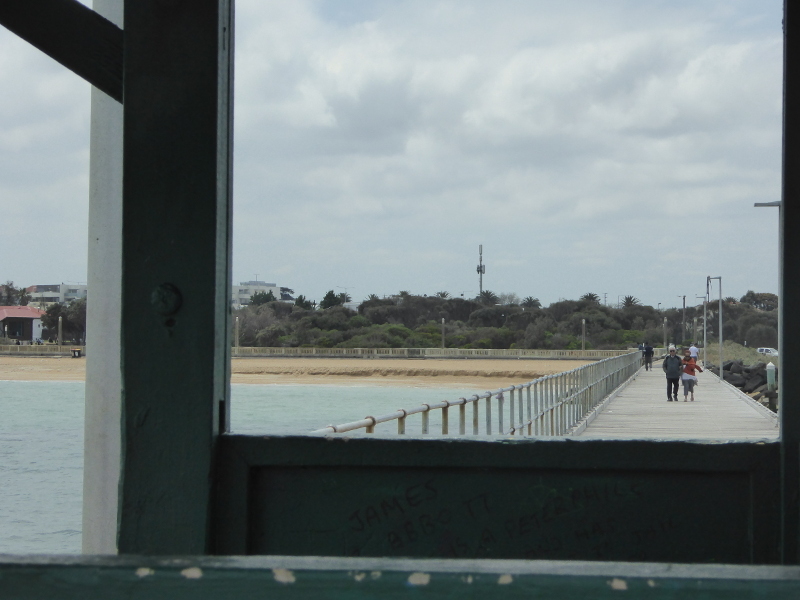 Tour de Cafe sits on the roadside right at the land end of Mordialloc Pier. It’s not an artisan Melbourne coffee shop, but it will do you a decent brew and it’s certainly handy for a quick break after your stroll on the pier (or for refreshment mid-fishing, I guess).